Showing up on search engines is definitely one of the most critical ways to grow your website traffic and expose your product, content or service to people who might be interested in what you have to offer. 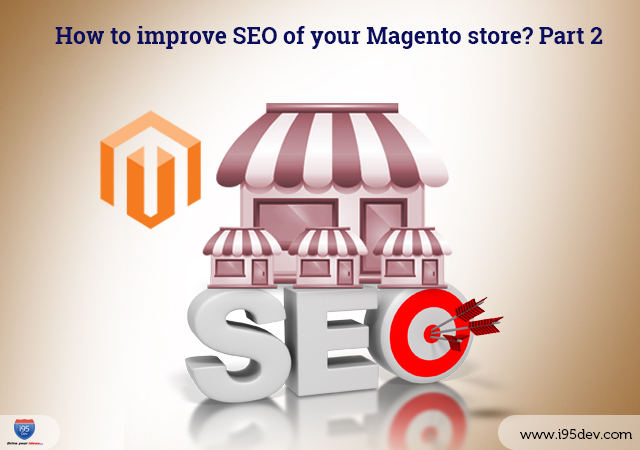 Our first blog of the series How to improve SEO of your Magento store? Part 1 speaks about managing URL rewrites and setting up Robots.txt File in order to improve SEO of your Magento store. The second blog add more to the previous one and will encourage you to practice a little SEO for your Magento website. 1. From the Admin panel, select Catalog > URL Rewrite Management. 4. Find the product in the list below and click to open the record. 5. Scroll down to the bottom of the Category Selection, and click the Skip Category Selection button. a. In the Request Path field, enter the new value for the updated URL. The Request Path must be unique for each rewrite. c. For your own reference, enter a brief description of the rewrite. 4. In the category tree, click to select the category that needs the rewrite. Over the course of time, your store may accumulate rewrite records that are no longer needed. You can delete obsolete rewrites from the list either individually or as a group of selected records. 1. In the list, select the checkbox of each rewrite to be deleted. If you change the settings of an existing URL Rewrite, it can take up to five minutes—and sometimes more—for the change to propagate throughout the system. Your store’s search index, as well as your browser cache must be cleared before the changes take effect in your store. 1. From the Admin menu, select Catalog > Search Indexing. 2. Click the Refresh Index button. It usually takes from 3-5 minutes for the change to take effect. However, depending on the time of day, it may take longer. If you don’t see the change right away, you might need to clear the cache of your browser. If the changes made to a redirect don’t seem to be taking effect, try a different browser, or follow the instructions below to clear the cache of your current browser. For Internet Explorer, on the Tools menu, select Delete Browsing History. Then, select the Temporary Internet Files checkbox, and click the Delete button. For Firefox, on the Tools menu, select Clear Recent History. Then, select the Cache checkbox, and click the Clear Now button. For Chrome, in the upper-right corner, click the icon with three horizontal lines. On the Tools menu, select Clear Browsing Data. Then, select the Empty the cache checkbox, and click the Clear browsing data button. Your store can be configured to automatically generate a permanent redirect whenever the URL key of a product changes. In the product record, the checkbox below the URL key indicates that permanent redirects are enabled for your catalog. If your store is already configured to automatically redirect catalog URLs, making a redirect is as easy as updating the URL key. 1. From the Admin menu, select System > Configuration. 1. From the Admin menu, select Catalog > Manage Products. a. Make sure that the Create Permanent Redirect for old URL checkbox is selected. If not, complete the instructions to enable automatic redirects. Select Catalog > Search Indexing. Then, click the Refresh Index button. A permanent redirect is now in effect for the product and any associated category URLs. To view the redirect records, select Catalog > URL Rewrite Management. The most recent custom redirects appear at the top of the list.